My favorite wine store, the Nicolas at avenue Emile Zola and rue du Commerce. This is not my favorite bakery, but what a cute sign! On the rue du Theatre. Now this is our favorite bakery. It is across from the wine store, and it has organic, authentic, artisanal French bread. Tom is on the right, going to buy a baguette and one croissant. 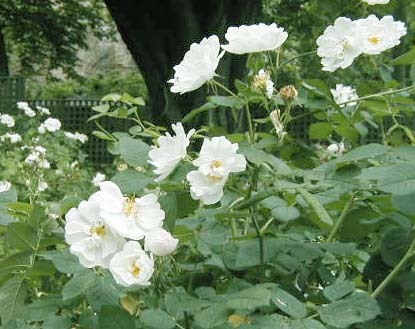 Roses in the garden at the Musée de Cluny. 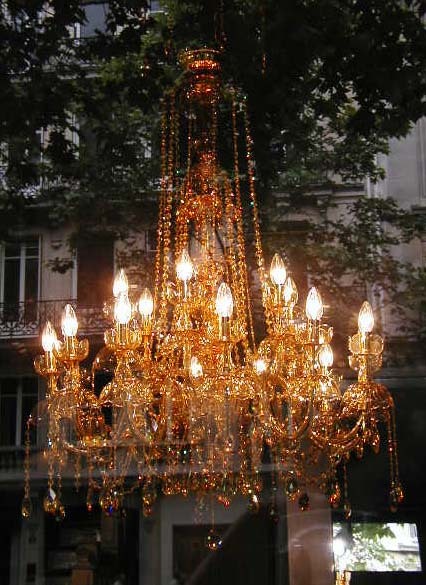 Yellow crystal chandelier for sale on the boulevard Saint Germain. View of the back of the ancient military school near us. Today I’m going to write about food, and that includes wine. Wine is food in France. We’ve been busy working, so there have been no journal entries for three days. Sorry about that, but do keep checking back. I rarely let it go for more than two days. I read French Women Don’t Get Fat not because I wanted to, but because we thought we might use a piece of it in the textbook. It turns out we probably won’t. But I was surprised that I liked the book. I thought it was going to be another stupid diet book, written by someone who wants to make a pile of money. However, it is not a diet book. It is a flawed but fascinating lifestyle book. And the woman who wrote it is already wealthy, so I don’t think she did it for the money. Yet she did shamelessly promote her company toward the end of the book. The author, Mireille Guiliano, is the CEO of Clicquot, Inc., the U.S. subsidiary of Veuve Clicqot, the company that makes expensive Champagne. She makes a lot of gross generalizations about American women and French women. Since I’ve spent 8 summers here in Paris now, I feel authoritative enough to make some pronouncements on her pronouncements. First, she says there are almost no fat French women. I can tell you that is not true. I would never use my camera to prove it, but take my word for it, there are plenty of French women who need to loose weight. She says Americans don’t use stairs, but French women do. Is she crazy? I worked for a company that had a campus with buildings that were 4, 5, 6 and 10 stories high. Lots of employees there routinely used the stairs instead of the elevator to get a little more exercise into their day. She says American women don’t need to and shouldn’t be working out in gyms because they are expensive and because they are like torture chambers. Yet she recommends doing what she does, climbing up 15 flights of stairs three times a week. Now THAT is torture. And of course on Sanibel, most of us live in piling homes without elevators, and we have to deal with at least one flight of stairs many times every day. She claims that Americans think she is crazy to take the stairs instead of the elevator. But I can tell you that since an elevator was installed in the building where we are in Paris in 1998, the neighbors here would think WE are crazy if we take the stairs up to the 6th floor. Anyway, when we return from a 3 or 4 hour walk, all those stairs would be overkill. I do agree that Americans have more of a weight problem than the French do. But the newspapers here have had several articles about an apparently growing epidemic of obesity in France, especially among children. I think this is because they are losing their traditional ways, due to globalization. This is where I agree with Mireille. She says the only way to approach food is with serious reverence. Sit-down dinners with the family, with a nicely set table, are a must. Food should be of the highest possible quality, freshly prepared, and elegantly presented. Yes, Mireille, yes. And we all need to consume more fruits and vegetables. But Mireille, even the French could use some improvement there, from what I’ve seen them consuming in the brasseries. They aren’t eating enough fruits and vegetables either. And wherever there is a McDonalds in France, check it out. It is full of French people and they are not eating fruits and vegetables. I already wrote about croque madames, but that is not all we eat at home. This year, I started buying mâche, otherwise known as lamb’s lettuce. I suspected that this green might be loaded with vitamins and antioxidants because it looks a little like a more delicate version of baby spinach, in little bunches. Check it out at Recettes et terroirs, but whatever you do, do NOT click on the English language icon. You will get gibberish if you do. If you click on the “Vertus” (virtues) link, you will see that this veggie is loaded with vitamin C, beta carotene, vitamin E, vitamin B9, and even Omega 3. And guess what? You can even buy it in the U.S., at least in California. See this product sheet from Epic Roots in Salinas, CA. Karen P., could Fresh Express bring this to us in Florida? Mâche has a wonderful, delicate taste. It is a great way to get someone who hates lettuce to come around to it. I’ve had it in restaurants here in Paris on several occasions in prior years. Now I buy it at the grocery and we have various mâche salads almost every day. Mâche is popular in Paris. You can find it in almost every grocery. It must be packaged, and it will only keep for four days or so in the fridge. But it is worth it. Buy it, and eat it. Okay, here’s a web site about mâche that is in proper English. On to fruits. It is possible to get the most wonderful peaches you can imagine in France in the summer. I bit into one the other day, and told Tom it was better than any Georgia or South Carolina peach I’d ever had. He said that the problem is the best peaches never make it out of Georgia and South Carolina. I agree with Mireille that peaches and other fruits should not be stored in the fridge. They should be kept in a bowl, at room temperature. And you can do that when you go to the market and buy only what you need for the next couple days. People here usually do not go to a supermarket and stock up for two weeks. However, that is changing. Will French people get fatter as a result? We shall see. On to wine. I don’t have time to write enough about it today, but I did stop in my favorite wine store to buy a bottle of Bourgogne Aligoté to leave for the apartment owners, and to get a bottle of Bordeaux Superieure at a ridiculously low price. While the Bourgogne (white) was 7 euros (about 9 dollars), the Bordeaux (red) was only 3.95 euros! And it is fantastic. They have had boxes of it stacked right next to the cash register, and I pick one up every time I go in there. It must have been some special purchase. So I only spent 10.95 euros, and I handed my American Express to Monsieur as I always do. He pleasantly ran it through the machine and politely handed it back to me. It was then that I noticed the tiny sign on the counter that said, in French, credit cards could only be used for amounts greater than 12 euros. I apologized to him for my faux pas (in French), but he said it was not a problem at all (as he handed me my credit card receipt). I told him “thank you, you are very nice,” in my slow French. He just beamed with politeness. I am sure I get special treatment because I am a “regular,” and he remembers me from previous summers. Even when he and Madame go on vacation, the two young men who run the shop then are equally nice. Tomorrow we check into a hotel for one night, then it is off to England to see wonderful friends. We’ll be back on June 30. But if I can find a good internet connection, I’ll continue the Paris Journal in England.